It is a common knowledge that Zimbra and Outlook are inherently different Webmail clients. Microsoft has developed Outlook to be used as a personal detail manager and is offered along with Microsoft Office Suite. In contrast, Zimbra Desktop allows users to manage multiple email accounts by acting as a single desktop tool, since it is an offline email client. Zimbra web client makes sure that every email account is maintained individually and makes it easy to setup any email account that uses POP or IMAP. Since, MS Outlook implements PST file format for saving data, the PST file can be easily imported or exported to local drive from Outlook. 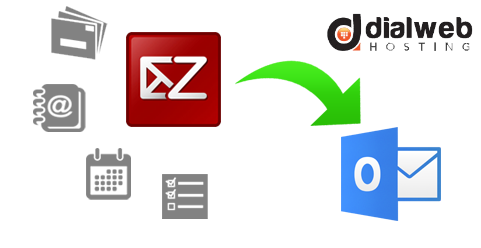 In contrast, Zimbra supports only .tgz files for data export and import. Fundamentally, Outlook and Zimbra are two different applications. In order to enable import of .pst file into your Zimbra desktop, the new Zimbra Migration tool that is offered along with Zimbra Collaboration 8.7., which only needs to be extracted and it is ready to be executed. The following guide will help you get an idea about importing a .pst file. In order to identify the file with .pst extension for its import into Zimbra desktop, find mail in control panel press properties and then Data Files to view the location. In case the file happens to be .ost instead of .pst, you need to open Microsoft Outlook then File, Open & Export and finally Import/Export. After opening the window of Import & Export wizard select the second from top option named as Export to a file. This step will take you to options for creating a file type. Here you need to select Outlook Data File (.pst). You will be select name of Account. You need to make sure that you have chosen Include Subfolders. Now you can select the location to save the .pst file as desired by you. You can enhance security by adding a password as asked at the end. You can view your .pst file by going back to the preceding screenshot. Now we are at the final stage of importing a .pst file into Zimbra Desktop. This necessitates use of a new tools called as ZCS Migration Wizard for Exchange/PST. Once you have extracted the file and executed Zimbra Migration, you can choose the third and the last option that is designed to import PST files to Zimbra Desktop local folders. In the next step you need to select PST file before proceeding next. Thanks to Zimbra team for its remarkable job, you are able to choose outstanding options that are ideal for long migrations to Zimbra from old providers including import only items beginning from a particular date, folders, and even run incremental migrations. The real time import progress can be viewed once the process begins. For more thorough progress view you may also open the log file. At the end of process, you will be able to access an overview of every migrated as well as skipped items that might be on account of errors or hassles in importing them. Now you can access all data by opening Zimbra Desktop including contacts, mail, tasks, folders, and calendar. You can also move objects from local Zimbra Desktop to Zimbra Collaboration Account only by performing drag and drop operation to account folders from your local folders. It is possible to run ZCS migration wizard nonstop. However as strongly recommended by Zimbra, you need to stop the wizard as soon as the process of account migration is over. IT professionals are aware that Zimbra Desktop and Microsoft Outlook are two separate email clients. Both these clients make individual file formats for email data management. Outlook uses Personal Storage Table (PST) file format for saving data objects and TGZ file format is created by Zimbra Desktop for saving zimbra email, data files, folders, tasks, and calendars among others. This rules out the use of manual method to import data related to Outlook PST files into Zimbra Desktop. Using Zimbra Migration Tool is a simple and reliable method to import PST files into Zimbra Desktop rather than using third party tools that may not be secure.